A network bridge is a Link Layer device which forwards traffic between networks based on MAC addresses and is therefore also referred to as a Layer 2 device. It makes forwarding decisions based on tables of MAC addresses which it builds by learning what hosts are connected to each network. 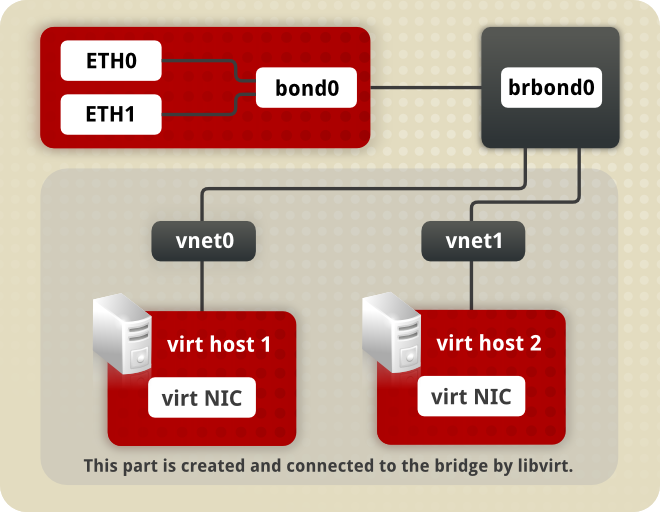 A software bridge can be used within a Linux host in order to emulate a hardware bridge, for example in virtualization applications for sharing a NIC with one or more virtual NICs. This case will be illustrated here as an example. To create a network bridge, create a file in the /etc/sysconfig/network-scripts/ directory called ifcfg-brN, replacing N with the number for the interface, such as 0. The DEVICE directive is given an interface name as its argument in the format brN, where N is replaced with the number of the interface. The TYPE directive is given an argument Bridge. This directive determines the device type and the argument is case sensitive. The bridge interface configuration file now has the IP address and the physical interface has only a MAC address. An extra directive, DELAY=0, is added to prevent the bridge from waiting while it monitors traffic, learns where hosts are located, and builds a table of MAC addresses on which to base its filtering decisions. The default delay of 15 seconds is not needed if no routing loops are possible. The NM_CONTROLLED=no should be added to the Ethernet interface to prevent NetworkManager from altering the file. It can also be added to the bridge configuration file in case future versions of NetworkManager support bridge configuration. You can see Section 11.2, “Interface Configuration Files” for a review of the directives and options used in network interface config files. If you are configuring bridging on a remote host, and you are connected to that host over the physical NIC you are configuring, please consider the implications of losing connectivity before proceeding. You will lose connectivity when restarting the service and may not be able to regain connectivity if any errors have been made. Console, or out-of-band access is advised. Using ethX as the interface name is common practice but almost any name could be used. Names such as tap, dummy and bond are commonly used. For further instructions and advice on configuring the bonding module and to view the list of bonding parameters, see Section 31.8.1, “Using Channel Bonding”. Figure 11.1. A network bridge consisting of two bonded Ethernet interfaces. We now have two or more interface configuration files with the MASTER=bond0 directive. These point to the configuration file named /etc/sysconfig/network-scripts/ifcfg-bond0, which contains the DEVICE=bond0 directive. This ifcfg-bond0 in turn points to the /etc/sysconfig/network-scripts/ifcfg-br0 configuration file, which contains the IP address, and acts as an interface to the virtual networks inside the host. Virtualization servers that intend to have distinct subnets for its guests while still ensuring availability in the event of a NIC failure will often combine bonds, VLANs, and bridges. An example of this configuration will now be given. By creating a bridge on the VLAN instead of the underlying device we allow VLAN tagging to be handled entirely through the host with no need to configure the guests' interfaces. Ensure the bond and VLAN have been configured as outlined in Section 11.2.5, “Configuring a VLAN over a Bond”.